Born in Udine, Luca Carlevarijs (sometimes spelled Carlevaris, 1663–1730) moved into the Venetian palace of his artistocratic patron Zenobio in 1679, and there he would spend most of his life. He is thought to have gone to Rome in the late 1680s, where he taught himself the art of painting views (vedute) from the Dutch painter Gaspare van Wittel (Vanvitelli). Carlevarijs, like Jan Vermeer, often used a camera obscura for details, which give his work a documentary quality rare for the age. His earliest known work was Le Fabriche e Vedute di Venezia, with over a hundred etchings of Venetian views and monuments that was considered the most comprehensive overview of the city to date. 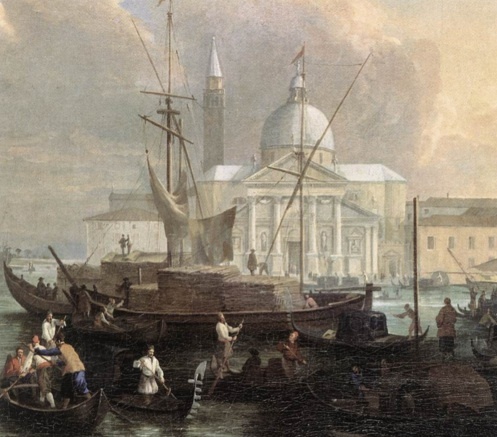 He was often commissioned to paint the pageantry surrounding the arrival of foreign dignitaries, after which the paintings would be given to the guests to take home as souvenirs and to glorify Venice. He later taught or influenced Canaletto and Visentini; Carlevarijs's own works may be seen in the Ca' Rezzonico and Museo Correr.